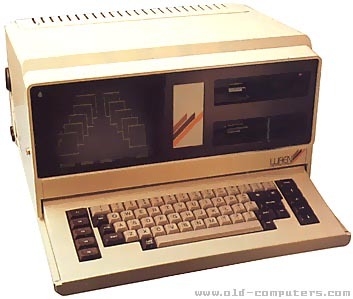 The Wren was one of the last "laptop" CP/M computer. It can be described as a combined personal computer and Teletext terminal. It weights more than 12 Kg ! This Computer was assembled at the Thorn EMI factory in Treorchy South Wales. Only about 1000 were made before Wren went bust and many companys were left holding the parts for the other 9000 units that were part of the first production run. It was very advanced for its day and the software package was very good quality and comprehensive for that era. Although the Wren computer was manufactured at Thorn EMI in Feltham, they were a subcontractor to Wren Computers Ltd. Wren was a joint venture company between Transam Microsystems (www.transam.co.uk) and Prism (who distributed computers for Sinclair). Transam have recently been aquired by Eurodata Systems. The Wren was sold with several good softs : Perfect Calc, Perfect Writer, Perfect Filer, Executive Desktop (agenda, phone directory, note-pad, etc. ), the popular BBC Basic (the same as the Acorn BBC or the Electron) and a communication application. Indeed the Wren has a built-in modem and is Prestel (english videotex) compatible. But it can also be used to automaticaly dial phone numbers stored in a directory. see more Thorn EMI WREN Ebay auctions !